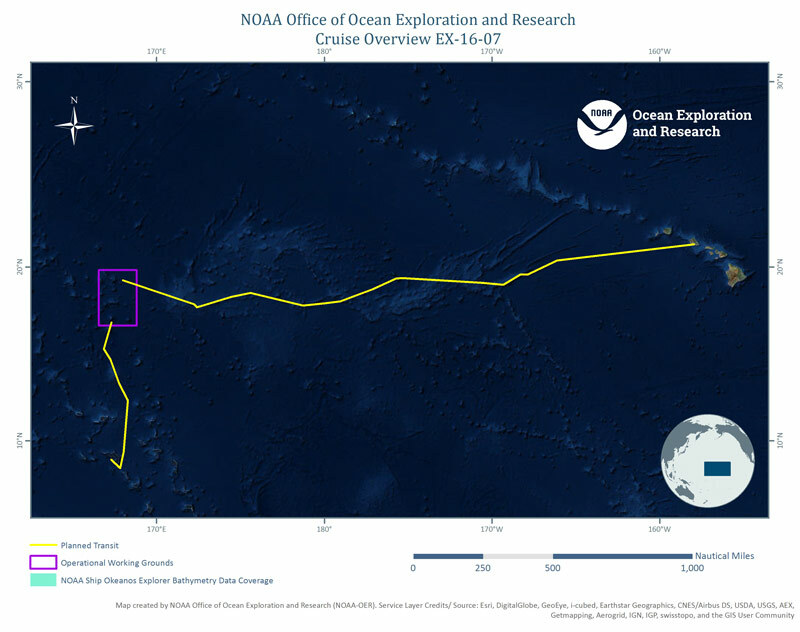 This expedition, as part of the NOAA Office of Ocean Exploration and Research's Campaign to Address Pacific monument Science, Technology, and Ocean Needs (CAPSTONE), marks the final of three expeditions of NOAA Ship Okeanos Explorer to the Wake Island Unit of the Pacific Remote Islands Marine National Monument (PRIMNM). This expedition is also the final cruise of the ship for her 2016 field season. From August 25 to September 11, 2016, the ship will transit from Kwajalein Atoll to the operational working grounds near Wake Island, followed by final transit to Honolulu, Hawaii. Mapping efforts will focus on using the ship's deepwater sonar systems, including multibeam, subbottom profiler, and several water column sonars, to explore several unnamed, previously unexplored seamounts near Wake Island. The seafloor data collected will result in baseline characterization and better understanding of these fascinating geologic features. Map of operational working grounds for the expedition. Image courtesy of the NOAA Office of Ocean Exploration and Research. Download larger version (jpg, 2.3 MB). These expeditions represent the most ambitious effort to date to explore this very large U.S. marine protected area. Originally created by President George W. Bush in 2009, PRIMNM boundaries were expanded by President Barack Obama on September 29, 2014, to include waters adjacent to Jarvis and Wake Islands and Johnston Atoll. PRIMNM is now comprised of seven atolls and islands in the Central Pacific Ocean, which are farther from human population centers than any other U.S. area1. The Wake Island Unit of PRIMNM encompasses 406,307 square kilometers of ocean area within the U.S. Exclusive Economic Zone. With the boundary expansion, highly pristine areas with unique biodiversity are now protected. This includes numerous seamounts (underwater mountains) that provide habitat for deep-sea corals, sponges, fish, invertebrates, and many other organisms. However, very little high-resolution mapping of this habitat has been done in this region. Telepresence uses modern computer networks and a high-bandwidth satellite connection to enable remote users to participate virtually in ocean research and exploration cruises. NOAA’s Office of Ocean Exploration and Research (OER) has been leveraging telepresence capabilities since the early 2000s. 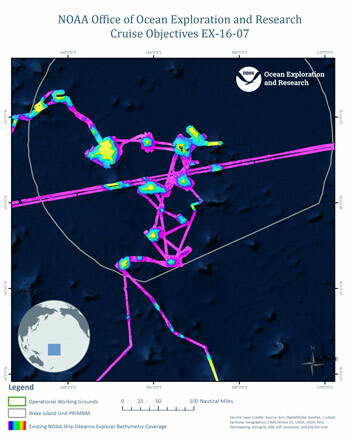 Through telepresence, remote users have provided support for operations planning and execution, troubleshooting hardware and software, and data interpretation during exploratory ocean mapping and remotely operated vehicle missions led by OER. 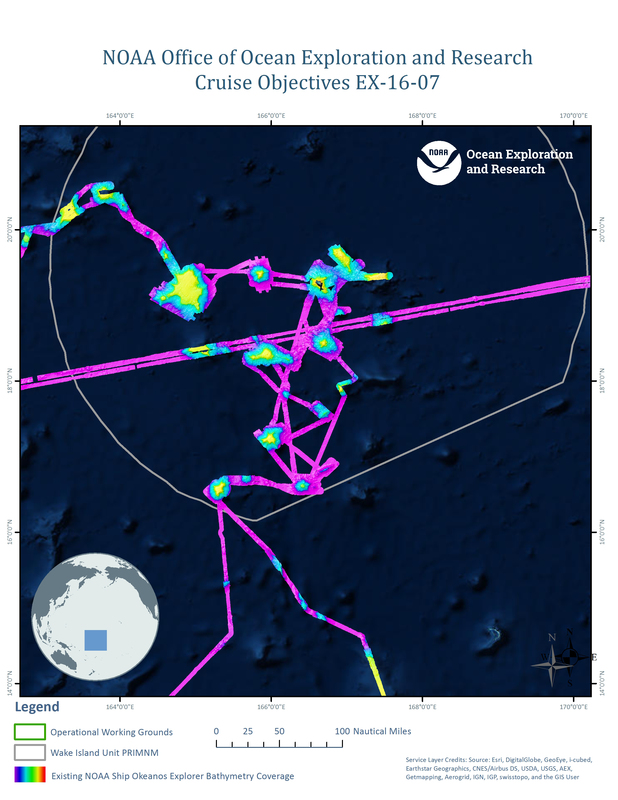 As shown in the planned cruise track in the map below, the transits between ports and the operational working grounds during this expedition are strategically planned to collect data over geologic features lacking modern sonar mapping data, notably partially within the Johnston Atoll Unit of PRIMNM. As an integral part of America's Ship for Ocean Exploration, the Okeanos Explorer mapping team strategically uses all possible data collection opportunities to further our understanding of the global ocean. Map of the overall expedition cruise track. Image courtesy of the NOAA Office of Ocean Exploration and Research. Download larger version (jpg, 1.8 MB).